Fort Lauderdale's St. Thomas Aquinas High School has developed a reputation as one of the best athletic schools in the country. It routinely wins the All-Sports Award from the Sun-Sentinel and Miami Herald, and recently one of those outlets that compares teams around the country named it the third best athletic school in the nation. That standing has been enhanced in the last year, as its track team won both boys and girls big school state championships last spring, followed by the football team in the fall, volleyball and softball, and just last weekend the girls soccer team won its 14th state championship. You read that right. Although its football coaches have built a dynasty, winning eight state titles since 1992 in a state with numerous strong high school programs, they are not even close to St. Thomas' winning-est coach. Carlos Giron came to the school in 1982, and in addition to his 14 state championships in girls soccer, he set a record for consecutive games without a loss. From 1994 to 2001 the Raiders went unbeaten in 158 games. That's a record that may last until eternity. The nearest team is a Texas school with 115. To put that in perspective, this year's state champions had one loss and a tie, both to Broward County schools. And it isn't as if South Florida schools are pushovers in soccer. To the contrary, Broward's American Heritage (which tied St. Thomas) won the state 3A title – its eighth championship. And Cypress Bay defeated St. Thomas in mid-season, only to lose in a hard fought regional playoff game. 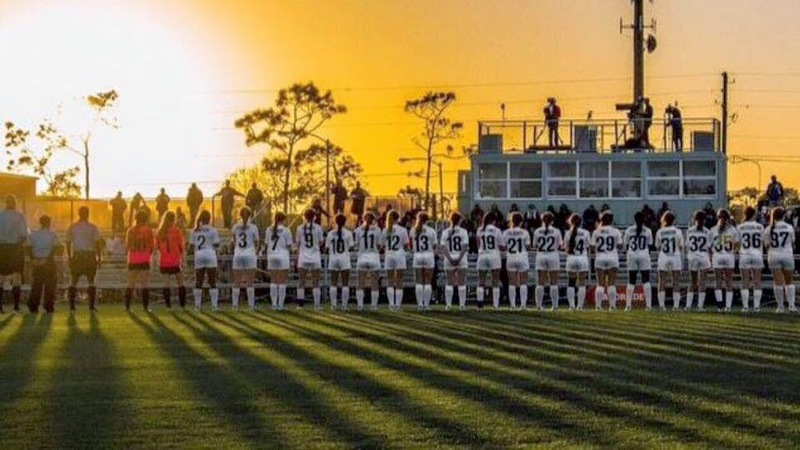 A cynic looking at these records might surmise that girls’ soccer is like football, where a few elite programs attract the best players, sometimes from distant locales, and benefit from transfers. Both St. Thomas and American Heritage got some of the area's top football players last year when University School lost its coach, and saw a mass exodus of talented players wanting to be on a winning team, with the exposure that brings to college recruiters. St. Thomas’ reputation for strong academics as well as sports has created a tradition of attracting sons and grandsons of well-known South Florida football families. It includes names such as Shula, Duhe, Bosa and Carter. Many of those top prospects, especially from lower income families, are on scholarship. Girls’ soccer is different. None of the St. Thomas players receive financial aid other than what they would normally get without athletics. More than 20 percent of the school's students get some aid. Nor is it a case of kids moving to the area or taking long trips to reach the school. Five of St. Thomas' best players this year came from one grade school – the downtown St. Anthony Parish. That's only fitting, for Central Catholic, St. Thomas's name until the 1960s, started at St. Anthony. Most of the other players come from neighborhoods that have historically sent kids to St. Thomas. One of Carlos Giron's coaching talents – at least this year – is his ability to build depth on his roster. He substitutes a lot compared to other teams, especially at the positions that involve the most running. Three of his wins enroute to the title fit a pattern. The opponents started strong, dominating early in the game. But by halftime, you could sense a momentum shift, and in the second half his fresh legs began to tell. This was especially true in the championship win over Oviedo, near Orlando. That team used few subs and after an impressive first half, it began to tire. St. Thomas shots on goal built; it was 19-6 at the end. And finally with five minutes to go, the Raiders broke through for a 2-0 win. In the spirit of the Brian Williams Candor School, we must admit that this detailed knowledge of this matter comes with a price. That price is confessing that one of the St. Thomas players has a name similar to ours. Of course, she is no relative, except our son’s daughter. If you are looking to get a relationship wall mount electric hearth then you've make a choice out from the available alternatives alone.